It tries to compare one course with another. 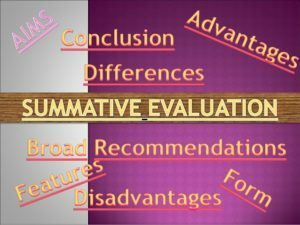 The approaches of summative evaluation imply some sort of final comparison of one item or criteria against another. It has the danger of making negative effects.This evaluation may brand a student as a failed candidate, and thus causes frustration and setback in the learning process of the candidate, which is an example of the negative effect. The traditional examinations are generally summative evaluation tools. Tests for formative evaluation are given at regular and frequent intervals during a course; whereas tests for summative evaluation are given at the end of a course or at the end of a fairly long period (say, a semester). Crediting is concerned with collecting evidence that a learner has achieved some instructional goals in contents in respect to a defined curricular programme. Certifying is concerned with giving evidence that the learner is able to perform a job according to the previously determined standards. It is concerned with promoting pupils to next higher class. a. It is terminal in nature as it comes at the end of a course of instruction (or a programme). b. It is judgemental in character in the sense that it judges the achievement of pupils. c. It views evaluation “as a product”, because its chief concern is to point out the levels of attainment. d. It cannot be based on teachers observations only. e. It does not pin-point difficulties faced by the learner. f. Its results can be used for placement or grading purposes. g. It reinforces learning of the students who has learnt an area. h. It may or may not motivate a learner. Sometimes, it may have negative effect.